This is not the Black Sheep from 1996 starring Chris Farley and David Spade. No, this is the Black Sheep from 2006, made in New Zealand, with special effects by Peter Jackson's WETA powerhouse, and starring no one you've ever heard of. Rather than explain to you what kind of movie you're in for, I think I'd be just as well off letting the poster do the talking. And what a poster it is. I'm especially fond of the tagline, which reads "There are 40 million sheep in New Zealand... And they're PISSED OFF!" If this poster doesn't clue you in to the fact that this film is going to be walking the fine line between comedy and horror, nothing short of a blow to the head will. The plot of the film is extraneous really, but here it is: Henry, our boring hero who grew up on a cattle farm before moving to the big city, is returning home. It seems Henry has developed a bit of a phobia against our fluffy white mammal friends, ever since a tragic farming accident left his father with a serious case of being dead. Henry has returned home to sell his half of the farm to his evil prick brother, Angus. With a name like Angus was their any chance he'd be anything but the movie's main villian? At any rate, it seems old Angus wants the full ownership rights to the farm because he's running a diabolical genetic engineering laboratory out of one of the barns. Oh yeah, and a couple of hippy tree huggers show up and spend a lot of time complaining about the meat industry and other such things that hippies like to complain about. So, being as this is a tale of science run amok, it's time for the science to run amok. 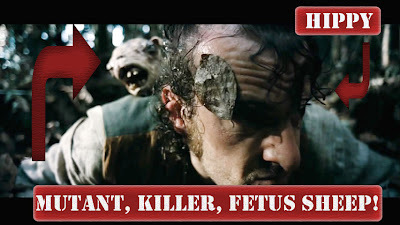 Those aformentioned hippies steal some highly biohazardous material which turns out to be a mutant, killer sheep fetus. One of the hippies gets bit by the thing before it escapes into the pastures where all the other sheep are doing their lazy, grazing thing. A few bites later and we have acres and acres of woolly, crazed, flesh eating, mutant beasties. This is the part where the movie picks up. Our unlucky heroes, consisting of Henry, Experience (the waifish hippy chick), and a farm hand named Tucker, have to travel across the open pastures, make it back to town, and raise the alarm. Angus, of course, will do anything he can to stop them. You may recall that I said there were a pair of hippies, not just one. Turns out that the bite of these creatures results in some serious cellular regeneration, creating MUTANT SHEEP MEN! I'll let you bask in stunned silence now. The final part of the film plays out a little like the Dead Alive with a mix of Night of the Living Dead thrown in. I wouldn't want to spoil anything, but the movie ends in a whirl wind of excitement. Black Sheep is one of those rare films that delivers exactly what the poster promises; Lots of fun and lots of sheep. The movie has its share of scares but is played largely for laughs. The film would no doubt be at home in a late night film festival rotation, surrounded by your slightly inebriated friends. There's a lot to love here and little to dislike. The special effects are cheesy but great, and all the acting is worthy of a Hollywood theatrical release. Fans of early Peter Jackson will be delighted to see a lot of similarities. That said, the movie still isn't perfect. Americans may be put off by slang-filled New Zealand dialogue. The pacing is a bit off as well, although I never found myself waiting impatiently for the next development to occur. The climax, while indeed climatic, didn't have the build up that lets you know that this is the big final moment in the film. It just sort of happens. The Bottomline: Black Sheep is a fun-filled film. It's not perfect, but horror-comedy fans will feel right at home. The film would play well at parties or social gatherings as the comedy/cheese quotient is high enough to keep horror casuals entertained. Recommended. 3 Bruces. I discur with your belief that all characters named Angus are villains. I refer, of course, to the eponymous film "Angus", a 1995 classic about a fat kid trying to make good. In this film, the main villain is named "Rick", which is another good villain name. He is also played by James "I do more than Dawson" Van Der Beek. To be honest, I had thought of that when writing the article. I submit for your consideration that the titular 'Angus' from the 1995 movie is the exception to the rule as stated.